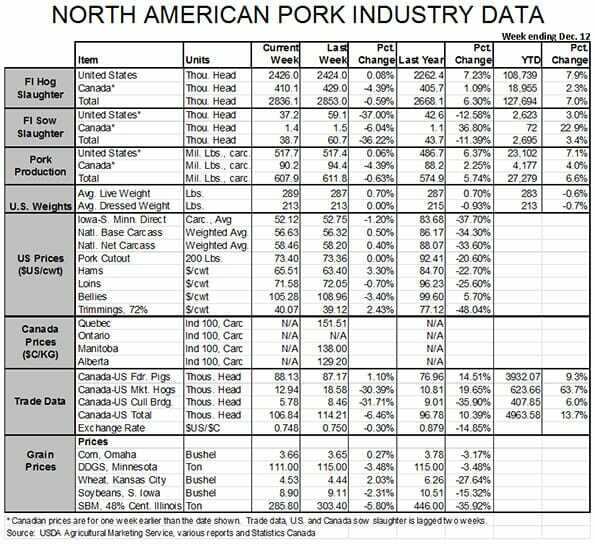 US - US hog slaughter grew once again last week, but the weekly total of 2.426 million was just 0.08% larger than the week before. 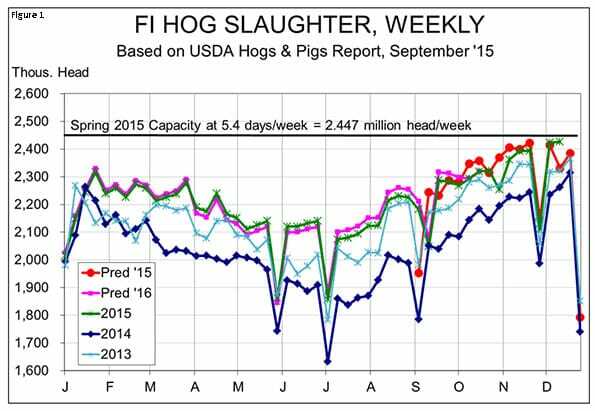 These weeks very likely mark the highs for hog numbers this year. That’s my story, and I’m sticking to it. My forecasts based on the September Hogs and Pigs report said that the week before Thanksgiving was likely the peak. That runs against a long-standing track record of the week after Thanksgiving seeing the largest number of hogs for the year as that lost day (or partial day as many plants operate to some degree on the Saturday after the holiday) leaves plenty of hogs to be shipped the following week. That historical relationship held this year and then last week’s total was 2,000 head larger. See Figure 1. Note that last week’s total was significantly larger than my forecast since the forecast was based on the September report’s inventory of 60- to 119-pound pigs, the first of which would theoretically be hitting the market now. These weight category breaks hardly ever match up smoothly with slaughter so I’m not too surprised by the discrepancy. 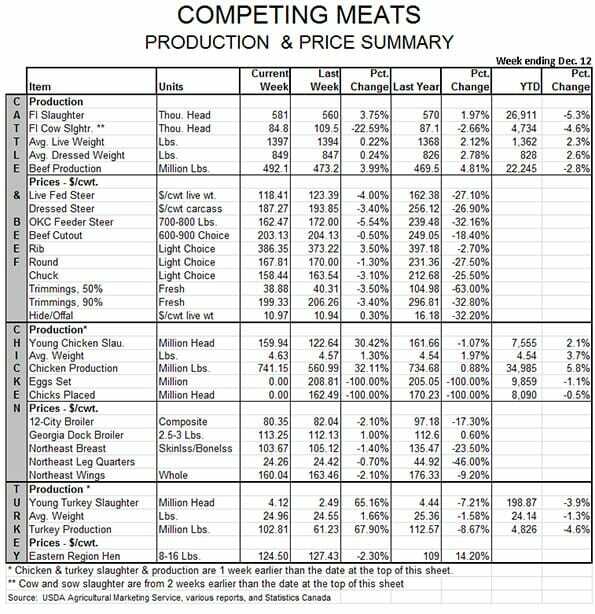 I would expect slaughter totals in the coming weeks to be more representative of that 60-to-119 inventory which, you may recall, was only 3% larger than one year ago versus plus-8% and plus-9.5% for the two heavier-weight inventory groups on Sept. 1. The 2.426 million was 7.2% larger than one year ago and brings the year-to-date total to 108.739 million head, 7.9% larger than last year. I believe we are reasonably current in our marketings as these numbers have been a bit larger than expected and weights have leveled off since early November. As can be seen in Figure 2, steady slaughter weights during November are a bit of an anomaly. 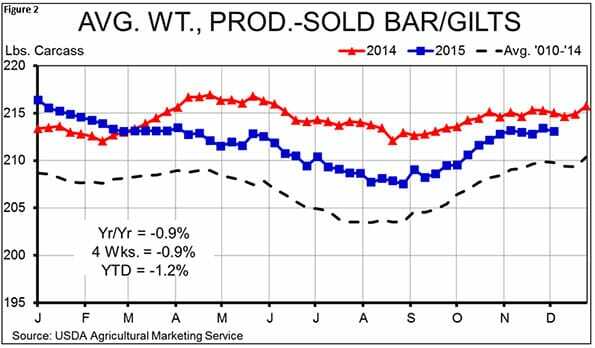 Growth of 1 to 2 pounds is more the norm for producer-sold barrows and gilts. If weights remain at this level for the rest of this year and then follow a normal pattern for the first quarter in 2016, I don’t expect market weights to match year-earlier levels until April. The year-on-year decline will be about 1.5% in January and get smaller thereafter, but I still expect weights to take about 1% off of the year-on-year production level during the first quarter. Cash hogs were more-or-less steady last week with Iowa-Minnesota declining 1.2% and National Base Carcass and Net Carcass prices making fractional gains. December Lean Hogs futures went off the board today at $55.475, down $0.525 for the session. That price was just $3.675 higher than the contract’s life low of $51.80 set on Nov. 17. The contract-life high for December ’15 hogs was $79.50 on the first day the contract traded, June 17, 2014. Summer Lean Hog futures gained roughly $3 per hundredweight last week and all of those contracts are now roughly $5 above their contract-life lows, also set on Nov. 16 or Nov. 17, depending on the contract. While February continues to be a dog at just $55.55, every other 2016 contract is trading above $64 as of today’s close. That price is certainly nothing to shout about, but our cost model puts 2016 costs of production for average Iowa producers at $67.81. Anecdotal evidence says that the best producers – who generally represent a disproportionately large percentage of total production – are $4 to $5 per hundredweight better than that level. That means that every contract beyond February is profitable for these low-cost operations and the summer contracts which all closed above $75 today would provide profits of $25 per head. While the luster of 2014 profits are gone, there is little on the horizon other than risk that would discourage U.S. producers from increasing output next year and in to 2017. Those risks are significant with mandatory country-of-origin labeling retaliation, a continuing strong dollar, the possibility of porcine epidemic diarrhea virus disruptions in the pork industry and highly pathogenic avian influenza disruptions in the poultry sector all looming. I don’t detect a lot of “gung ho” or “damn the torpedoes” attitudes out there, but I do sense some resolve to push forward with expansion plans that have been in place for a long time and may have been shelved in 2014. I have two concerns about that growth. First, pork demand is not growing at near the pace it did in 2013 and 2014. Real per capita expenditures have been very close to year-ago levels for six months now, suggesting that the bid surge may be over for a while. Second, I still fear that too many of the “new” pigs will arrive in 2016 before we have the packing capacity to handle them. We’ll need more pigs when two new plants open in 2017 but not until then.